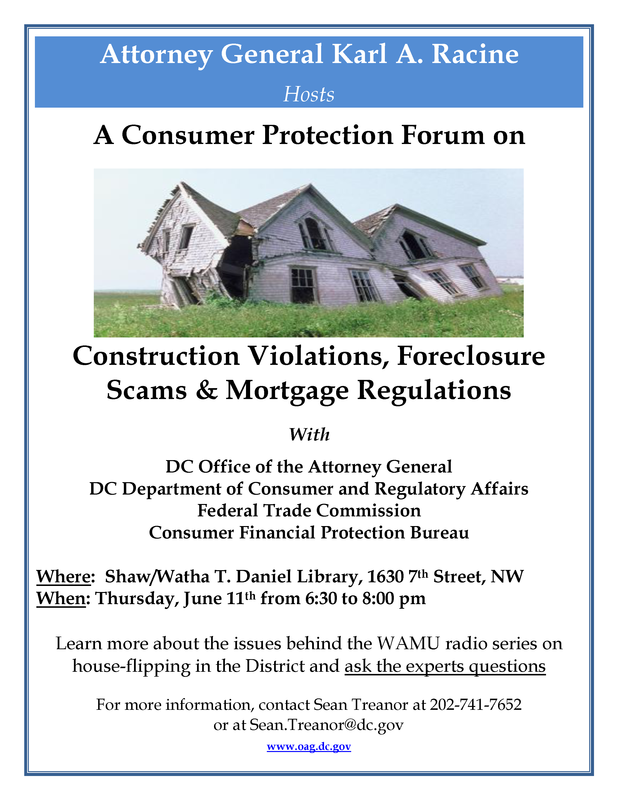 The Office of the Attorney General is hosting a forum to educate homeowners and homebuyers on scams and pitfalls on Thursday June 11th from 6:30 -8:30pm at the Shaw/Watha T. Daniel Neighborhood Library, 1630 7th Street NW, adjacent to the Shaw/Howard University Metro Station (R Street Exit). Attorney General Karl A. Racine, other Office of the Attorney General (OAG) staff, and representatives from the D.C. Department of Consumer and Regulatory Affairs (DCRA), the Federal Trade Commission (FTC) and the Consumer Financial Protection Bureau (CFPB) will educate homeowners and those looking to purchase a home about potential consumer pitfalls associated with homeownership – including construction violations, fraudulent contractors and house-flippers, foreclosure scams, mortgage regulations and other issues. The experts will also answer consumers’ questions. Earlier this month, OAG filed suit against a Virginia couple who, the suit alleges, have violated District law by selling improperly and unlawfully renovated homes. As part of OAG’s consumer-education efforts, the agency is partnering with other District and federal government agencies to reach out to homeowners and potential homeowners to educate them on how to protect themselves and their investments against such bad actors. For more on OAG’s house-flipper lawsuit and tips for those purchasing and renovating homes, see: http://oag.dc.gov/release/attorney-general-sues-house-flippers-serial-shoddy-and-unlawful-work-shares-tips-home-buyers. Posted on June 7, 2015, in Meetings and tagged Housing, OAG. Bookmark the permalink. Leave a comment.